Today I decided to go off the beaten track and visit the Musée de l'Air et de l'Espace. 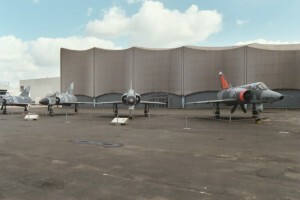 I say off the beaten track because this museum is outside of Paris at L'Aéroport de Paris - Le Bourget. Getting there was half the experience. I bought a billet (ticket) for the RER. Luckily the ticket agent spoke halfway decent English and the fact that I held up the map and pointed to where I wanted to go helped. I took the Metro to the station where I could transfer to the RER and hopped on the first RER that stopped. There's two different trains that take this route and on the map they both pass Le Bourget, where I needed to go, so I figured it didn't matter which one I got on. I found out a few days later that this wasn't true, but somehow I did manage to catch the right one. According to Joel's travel book there would be signs telling me where to go at Le Bourget station. The book was wrong. When I got off the train there were no signs. After spending a few minutes looking for signs I finally asked the ticket agent at the station, "est-ce que vous parlez anglais?" To which he replied in a very heavy accent "a little bit." He gave me the directions including the bus number I needed to take, but I didn't quite get everything he said. After waiting a few minutes for the bus and not seeing the bus number I needed listed at any of the stops I asked again and this time someone else told me I needed to walk up a block to catch the bus. After finally figuring out where to catch the bus, the rest was easy. The stop was called Musée de l'Air et de l'Espace and with all the airplanes in front of the building it was hard to miss. 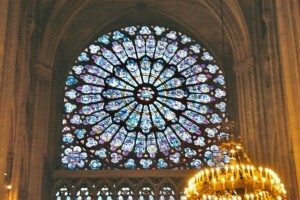 The displays in the Grand Galleries were amazing. They had a huge collection of memorabilia from the very first manned hot air balloon. You can see how fanatic society got over that first flight. They had everything painted with pictures of the balloon; tea cups, plates, chairs, carpets... 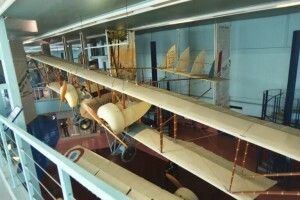 The other section of the Grand Gallery had a large collection of the very first planes from as early as 1879. It was fascinating to look at all the different ways people where trying to create something that could fly. They had pre-flight planes from France, England, and the US. Many looked like birds, some even with feathers. There was one that looked like a bat. The third section of the Grand Gallery had post-flight planes. You could see how once engineers understood the concept of the airfoil they kept tinkering with the designs to get faster and more stable aircraft. Some had engines in the back, some on the front, different numbers of engines, different numbers of wings. Here's a photo of one of the early French biplane. The rest of the Grand Gallery had planes of the WWI era where they had started to mount machine guns on the planes. They had many different designs of guns on display. The early ones were very good at shooting up your own plane. They gradually added modifications, in some cases adding deflectors to the propellers, until they finally had guns that did more damage to the enemy's plane than their own. Other items in the museum where prototype jets, such as this Leduc 022. The Leduc was an early supersonic ramjet prototype which hit mach 1 on December 21, 1957. It has a very unusual design. The pilot sits in a glass module in the middle of the engine's air intake. There were also a lot of Mirage fighters, the prototype of the Concorde, and a very good section of space flight. The visit to The Air and Space Museum was definitely worth the trip, however I'd recommend to anyone else that they pack a lunch. The only food they have at the museum is a small cafeteria consisting of vending machines. By the time I left the museum I was starving. I took the RER back to Paris. When I left the train I ended up inside a gigantic shopping mall that was several stories underground. Disoriented and hungry I eventually tracked down a McDonald's inside the mall. Thank goodness for American fast food. Since it was getting close to 3:00 I really wanted to make it to the Musée d'art et d'histoire du Judaïsme quickly so I could see as much as I could before they closed at 6. Somehow even with the map I ended up getting a little lost. The map made it look easy, but in actuality the streets curve and twist and there's all these narrow side streets that look more like alleys. Security at the Museum is very good. The guard controls the x-ray machine and the metal detector remotely. It's set up to allow only one person through at a time and he won't let anyone through until he's absolutely sure they're not caring any type of weapons. He even asked me some questions about the contents of my camera bag after viewing it's x-ray. Unfortunately the museum doesn't allow any photography so I don't have any photos. They don't even allow you to carry your camera, it must be checked at the coat check. Unlike in the US, most museums in Paris have free coat checks. Something I didn't find out about until after I had carried my coat through several museums. The audioguide in the Jewish Art and History Museum is also free. The audio guide was very nice and had good music, but wasn't conducive to my visit since I had very little time before the museum closed. The museum contains a very nice collection of art and religious artifacts and traces the historical evolution of Jewish communities living in France and Europe from the Middle Ages to just before WWII. I found my visit to be brief but very worthwhile. 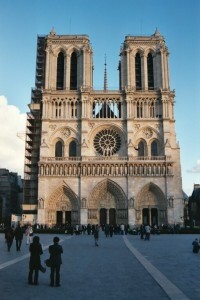 After being shooed out of the museum so they could close I decided to try and make it to Notre Dame before the sun set so I could get a nice photo. I got there just in time. In fact the sun went behind the building about two seconds after I took the picture. 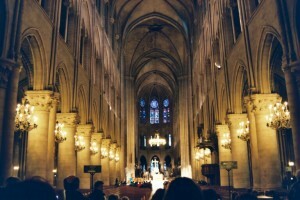 Notre Dame is enormous with high vaulted ceilings and beautiful stained glass. For diner Joel and I decided to go to a nice French restaurant on Champs Elysees. We sat next to a gentleman who was eating escargot. Whoever considered picking snails out of their shells with a toothpick and eating them as fine dining hasn't seen anyone eat a bucket of escargot. I decided to stick with eating fish. 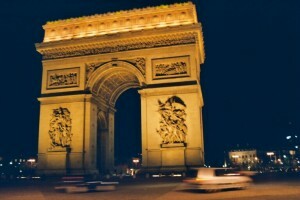 After diner we walked over to the Arc de Triomphe. With this being my last day in Paris I would have liked to walk over to Place de la Concorde, but my feet hurt too much and we needed to up early the next day. There's still a lot of Paris I didn't see so I guess I'll just have to come back another time.